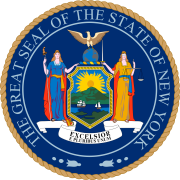 The 1884 New York state election was held on November 4, 1884, to elect two judges of the New York Court of Appeals, as well as all members of the New York State Assembly. In 1884, the terms of the only two remaining original judges of the re-organized Court of Appeals expired. These were the only state officers to be elected statewide this year. The Democratic state convention met on June 18 at Saratoga, New York. William E. Smith, of Clinton County, was Temporary Chairman and President. Democrat Charles A. Rapallo and Republican Charles Andrews were nominated for judges after a viva voce vote almost unanimously, thus endorsing the resolution of the Republican convention that "the Court of Appeals should be removed from politics." The Greenback-Labor state convention met on August 30 at Masonic Hall in New York City. H. Alden Spencer was Temporary Chairman until the choice of George O. Jones as President. Prof. Isaac L. Rice, of New York City, and Patrick H. Cowen, of Saratoga County, were nominated for judges of the Court of Appeals. The jointly nominated incumbents Rapallo and Andrews were re-elected. ^ This ticket was nominated by the Greenback Party, the Anti-Monopoly Party and the organization of that year's presidential candidate Benjamin F. Butler who in the press were referred to as the "People's Party"